Afreen Dewan in Dallas, Texas, after text messaging her own vote, calls up her friends and family in the US, Canada and Bangladesh to ask them to vote for her favourite candidate in Close Up 1 Tomakey Khujchhe Bangladesh. The talent hunt show started in 2005 on private television channel ntv and was an instant hit. It sought young singers from around the country, filtered from thousands to 16 finalists, then 10, five and three to the winner. It was a big success in its first year and even bigger in the second, which recently ended last December with Bangladeshis living in the UK and US also participating. Besides the jury panel, audience from home and abroad text messaged their votes by cell phone to help their favourite win. This is only one example of just how interactive television has become. Add to that all the talk shows, phone-in and question-answer programmes, and "idiot-box" seems hardly an appropriate name anymore! For, though dramas, films and other such entertainment programmes may still be the most popular on television, infotainment programmes are rapidly gaining wide popularity among the audience. Indeed, research has shown that local content is the first preference of television audience. Only if it is not satisfying do they turn next to regional, and finally, to global content. Local appeal combined with quality are deciding factors in choosing television content. Due to BTV's fallen quality, those who had the choice obviously turned to other, foreign options. 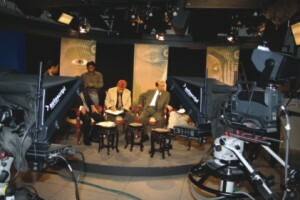 With viewers hungry for information and analysis, talk shows are becoming increasingly popular. Ever since private channels came into operation and began their news broadcasts, etc., people have been given a platform to voice their views and opinions, agrees Shykh Seraj, Director and Head of News, Channel i.
Concurrently, talk shows also started. 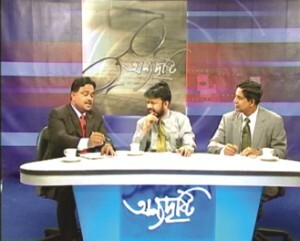 One of the first and most popular talk shows today is in fact Channel i’s “Tritiyo Matra”. Not only politicians, but regular citizens are also much more vocal today through interactive programmes on television like Channel i’s “Public Reaction” and ntv's "Muktangon". 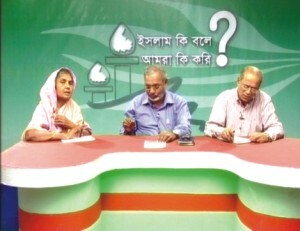 While shows like “Tritiyo Matra”, “Onnyo Drishti” on ATN Bangla, “Article 39” on Banglavision and “Mot Motantor” on Channel 1 usually bring in politicians or prominent citizens to discuss contemporary political issues among themselves, others bring in audience participation as well. 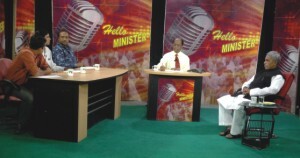 “Agamir Kantho” on Banglavision and "Na Bola Kotha" and “Saaf Kotha” on Channel i bring in these personalities to face questions from members of the audience who are present with their own input as well as queries. 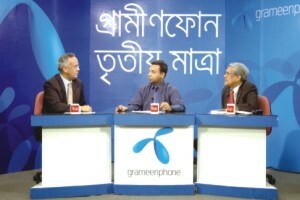 Other shows like “Tele-Helpline” on Channel i have the audience phone in to put questions to the panel of discussants, on issues ranging from the political crisis to consumer rights. The good thing about these shows is that they give people scope for open discussion. This was unheard of just a few years ago, when editing as well as self-censorship prevented people from speaking their minds. While this allows politicians to give what may be a less-than-honest version of things, it has helped to bring many issues out into the open which were previously swept under the carpet, whether due to political reasons or social taboo. Besides talk shows, there are a whole range of other programmes on our private television channels today. These include morning shows, reviews of the day's newspapers and the week's news, musical programmes, shows on home living and cooking shows, such as the ever popular “Siddiqa Kabir’s Recipe” on ntv. 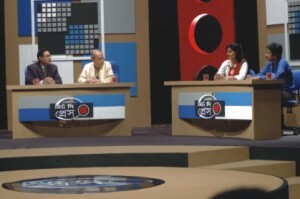 Ntv has also broadcast quiz shows and debate programmes in the past. One of the channel’s new additions is “Fame and Fortune”, in which viewers text message their answers to quiz questions to win prizes. Another recently launched programme is “Shomo Shomoy” on art, literature and culture. Many shows bring in celebrities. Some popular ones include writer Emdadul Haque Milon’s “Ki Kotha Tahar Shathe” on ntv and “Amar Ami” with actress Api Karim on Banglavision. 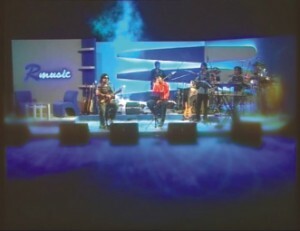 “Jugolbondi”, hosted by actress Shanta Islam on Rtv, features celebrity couples. Still others have the audience phone in with questions as on “Taroka Kathon” on Channel i. Actress Shoumi Kaiser talks to women from different professions in each episode of “Joyitar Joyjatra” on ntv. There are of course also the Islamic programmes on all the channels, in which Muslim clerics discuss as well as take questions on Islam from the audience through letters and emails. Many programmes are occasion-based. The recent Eid saw a wide range of not only dramas and tele-films on all the different channels, but also magazine programmes, celebrity talk shows, etc. Similarly, the upcoming general elections are cause for heated debate and discussion. 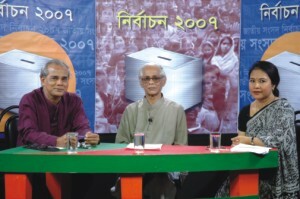 Programmes like “Nirbachon 2007” with Muhammad Jahangir on Channel i, “Gonotontro o Nirbachon” and “Prothom Voter” on ntv (on first-time voters), have been especially designed with them in mind. Shykh Seraj, however, disagrees. “Dramas used to be the most popular television programme,” he says, “but then came shows like ‘Chhayachhondo’ -- on film songs -- then magazine programmes.” People’s tastes have changed over the decades and this is reflected in the television content, says Seraj. Channel i, for example, does not air only entertainment programmes during “prime time”. With so many channels airing similar programmes, does quality suffer? And is there still anything missing? On the other hand, some people think there are things still missing on the television screen. “There aren’t as many programmes for young people,” opines Arman Khan. Also more or less absent, notes Harun, are game shows. “The Bangladeshi audience just do not take to game shows as much,” he says. Harun recalls a time when game shows were introduced, but they did not strike a chord with our audience. 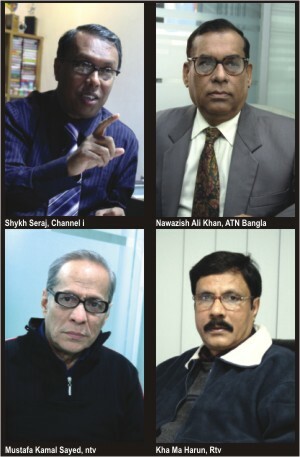 And indeed, the Bangladeshi television industry is a growing one, with new channels going on the air every few months. There are currently 10 private channels in operation and a few on test transmission, with 69 more reportedly awaiting government permission to launch. 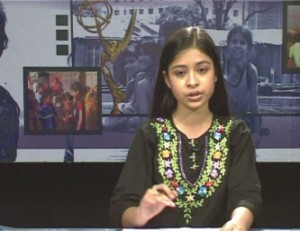 Also due to go on the air soon is Bangladesh's first 24-hours news channel, CSB TV News. It seems that in our country, television channels have become like any other commodity for sale. How else does one explain an ad in a national daily asking the reader to "Own a TV Channel" for as little as $USD 9,950? Yet, even with all the competition, credibility is still an issue. It is alleged that objectivity and democracy are lacking even on private television channels. Media experts, academicians and politicians have pointed out that in the absence of proper media policy, licences for launching new channels are given based on political consideration. Thus the launching of at least five channels during the immediate past government’s tenure, owned by its party members and cronies. And, with the upcoming elections, a change in power -- or not -- may be reflected on the silver screen. The closing down of ETV in 2002 -- allegedly due to political reasons -- is still fresh in people’s minds, especially now that the channel has begun test transmission under the current caretaker government, on its way to being re-launched. The threat of politicians and businesspeople becoming journalists is a grave one to press freedom and objectivity. There is always the question of just where these politicians got the estimated 60 to 70 crore taka to effectively run a television station. In addition, the dark deeds of the owning politicians -- as well as large advertising sponsors -- will be conveniently covered up by the media. Those of their adversaries will be highlighted and the audience will be left at a loss, trying to piece things together and figure out for themselves what exactly is happening. Overall, however, the response to private television channels has been positive. A proper system of rating programmes is, however, necessary, says Harun, and organisations should come forward to do this. Television has entered a new era where its purpose is not merely to entertain. Today, not only does it inform the audience about the latest in what is happening, but it gives them the opportunity to express themselves by voicing their own thoughts and opinions. The glamour of the silver screen combined with its education-information value and, most recently, its interactivity, has made television more popular and more important than ever before.